JLS have promised that their next album will be their most personal one yet. The boy band - Oritse Williams, JB Gill, Aston Merrygold and Marvin Humes - are aiming to give their fans a Christmas present to remember with their third album. Oritse said: "It's a progression of all the music. There are a lot of life experiences and a lot of things that we went through over the last few years and we wanted to talk about them in this third album. "It gave us the opportunity when we had time to just sit down and write in the studio to just pour our hearts out. 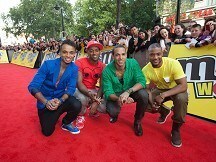 We're very excited for fans to hear a very honest, honest side of JLS," he continued. His bandmate JB said the group, who launched the new M&M's World store in London, have been busy writing tracks in between their UK tour and gigs. "We are in the studio at the moment and hopefully the album will be with you guys towards the end of the year," he revealed. "We have written most of the songs now, about 60 to 70 songs and we have been fine-tuning and whittling them down to about 18, which we'll then pick an album of about 13."